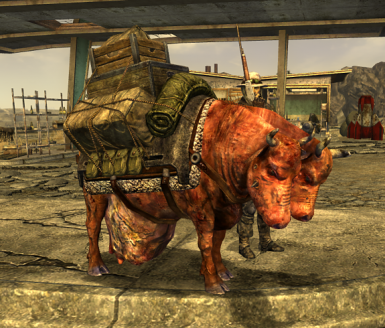 Using NifSkope I pasted the Brahmin Calf model over all the other types (or rather the accessories into it's file), and so far it seems to be working fine. Thanks for doing this, the original models really gave me the creeps. I wish you had done the version with one head missing horns, but what you gave us is pretty great. 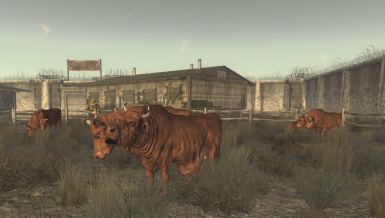 That's a really great idea the Brahmins in Fallout 1 and 2 didn't have horns someone should make a mod like that. 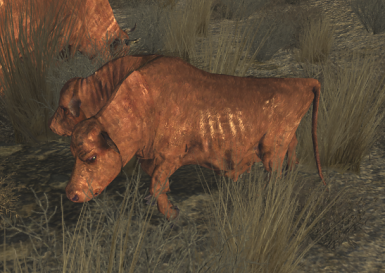 I wish there was a mod that makes Brahmins furry. Nice to have some variety. It always felt weird to have only 1 type of animal. Dose baby brahmin are the cutest. There is a new dog variety mod on Fallout3nexus, so might as well team up. Very good, reminds me of the Brahmin from Fo1 and 2. Saw it now too. Will try to fix it, but for now I have no clue, why that happens at all. Same problem as Earende. The traveling merchant brahmins don't stop swaying left and right, it's rather annoying.